Service Spotlight: 5-Axis Waterjet Cutting | KLH Industries Inc.
KLH Industries has purchased a new Flow Mach 3 Series waterjet with two very significant extra features – a 5-axis cutting head and a 90,000 psi pump. In the world of waterjet, cutting pressure, or psi, directly equates to cutting speed. The cutting stream travels faster, carrying each abrasive particle with more momentum. With more cutting power, the machine is free to move faster along the geometry path. Flow’s high-pressure pump, called HyperJet®, is capable of cutting pressure peaking at 94,000 psi. That’s over 1,800 times the pressure of the average garden hose (50 psi). Compared to a 60,000 psi rated pump, the Hyperjet® is 30-50% faster. KLH is not only waterjet cutting at some of the fastest speeds in the industry, but will now do so on three-dimensional parts as well. The 5-axis waterjet cutting head, which Flow has coined the Dynamic Waterjet® XD, articulates in any direction up to 60 degrees. Click here to see 5-axis waterjet cutting in action. While 3-axis machines are more prevalent in the market, Tim Henning, Waterjet Manager, says 5-axis waterjet cutting has opened up a new area of applications for an already versatile process. Geometry that requires a beveled edge on the welding joint can now be waterjet cut in a single setup, without any secondary machining. 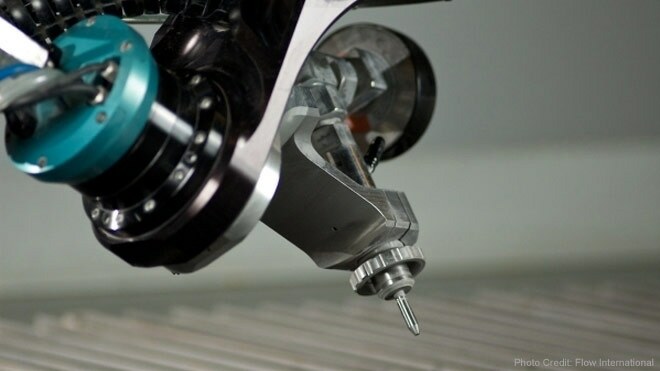 The five-axis cutting head even articulates far enough to cut a bevel on the underside, for double bevel or double-V joints. Those already familiar with waterjet cutting know that the process has an inherent taper. If you’ve ever spilt your coffee on your desk, you know that liquids naturally dissipate without a container. Even the stream from your showerhead is moderately larger by the time it hits the floor. Overcoming this principal of nature is a big issue in the world of waterjet. At high velocities the taper worsens, reducing cutting accuracy. With 120 degrees of total articulation, the expectation may be that the additional range may exacerbate the taper even further. However, even during 5-axis motion, the dynamic waterjet is automatically monitoring and tilting the head on the fly. The machine is constantly compensating for the taper, so there is no need to sacrifice accuracy for articulation. The bottom line is if you order a 45 degree taper from KLH, you’ll get a 45 degree taper. Contact KLH to learn if your parts can be cut with a 5-axis waterjet.